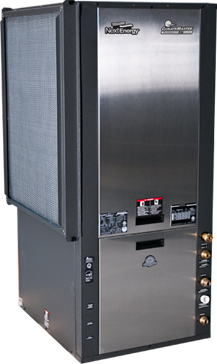 The Tranquility 30™ R410A forced-air heat pumps delivers the highest efficiency ratings in the industry. Self regulating two stage technology allows the Tranquility 30™ to operate at the most efficient speed for all weather conditions. Equipped with an electronic variable speed fan motor (ECM), the Tranquility 30™ controls system air flow to assure high operating efficiency and superior dehumidification. This translates into increased monthly savings on utility bills for homeowners. Only the highest quality materials and components are used in every Tranquility 30™ unit. Additionally, each unit is run-tested in our factory to ensure optimum performance. Installation and service features on the Tranquility 30™ include swivel water connections, internally trapped condensate, and mutilple access panels and ultra reliable dual Copeland scroll compressors. The Tranquility 30™ is available in sizes ranging from 2 ton to 6 ton nominal capacities. The Tranquility® 30 Series provides you the MOST energy savings of any space conditioning system available. The advanced two-stage compressor and variable speed fan maximize efficiency while EarthPure® Ozone Safe refrigerant provides unprecedented environmental protection. The system is engineered for quiet, efficient operation and comes in multiple capacities and a variety of configurations. Featuring the latest in geothermal heat pump technology, the Tranquility® 30 Series delivers comfortable, environmentally responsible heating and cooling plus savings on your utility bills. ► Extra high efficiency (EER 30) produces significant energy savings. ► Powered by electricity instead of fossil fuels. ► Consistent geothermal temperature reduces energy use. ► Optional hot water generator can lower home hot water cost. ► Heat pump installation may qualify you for a tax credit. ► Roughly 75% to 80% of heat supplied comes directly from the earth itself and is clean, free and renewable. ► Little or no CO2 emissions help prevent global warming. ► EarthPure® Ozone Safe refrigerant has higher efficiencies and zero ozone depletion for unprecedented environmental protection. ► MERV II filter removes up to nine times more dust, lasts three times longer and captures nearly 100% of pollen and spores compared to traditional fiberglass air filters. ► Two-stage technology automatically adjusts itself to provide the optimum, consistent indoor air temperatures regardless of the weather extremes. ► Variable-speed blower motor (standard) adapts to various duct systems for greater flexibility and helps even out hot or cold spots. ► Insulated compressor compartment and interior cabinet, plus no noisy outdoor fans reduce noise. ► Automatic alerts, simplified controls, and easy, lift-out access panels make it easy to use and service. ► E-coated air coil resists corrosion for longer life and improves moisture removal capabilities for additional comfort. ► Cabinets are heavy-gauge galvanized steel and epoxy powder coated for durable and long-lasting finish. ► The drain pan is stainless steel, both corrosion and stain resistant, and slopes to facilitate drainage. ► Geothermal heating and cooling has no flame, no odors, and no danger of fumes. ► Tranquility® 30 is engineered for safety with compressor, overflow, and freeze protection, plus a shut-down switch and fault lockout.